Heading for Greece along a stunning coastal road, the views were unreal. Not sure how many times I can write this, but they just seem to get better. The weather was still hot, clear blue skies, and hardly any wind on the sea. The road followed the coastline down to Sarande, where we stopped for a late lunch. 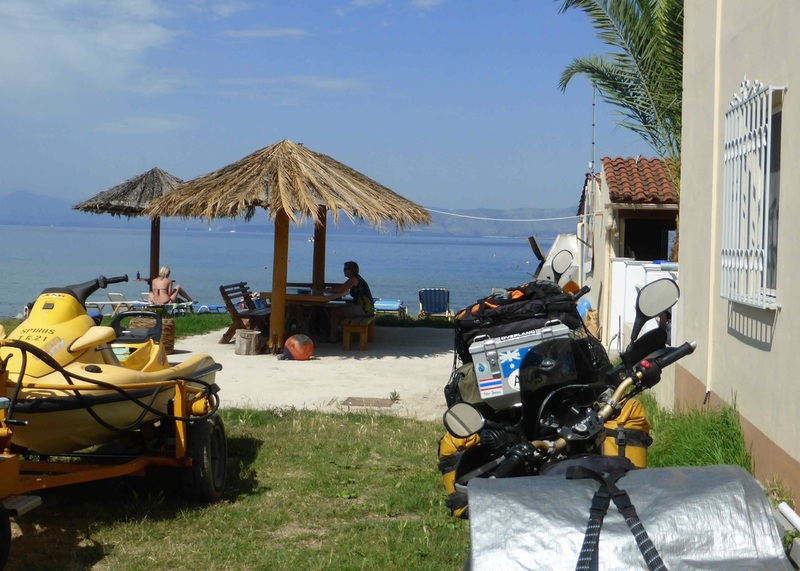 Looking at the map, we realised the island we could see was Corfu, so we made some enquiries and found there was a ferry for it leaving at 4.00pm that day. Decision made, we went to organise some tickets. While there, we met Hakan and Thomas, from Sweden, and had a chat about our trip. They were going across to Corfu as well, so we would meet up with them again on the ferry. As Corfu is part of Greece, we had to do the customs and immigration thing, clearing Albania at the port on the mainland, and entering Greece on the island. We realised on the ride down the coast that we didn't get insurance at the border on entering Albania, and our green card doesn't cover it, so we were happy and lucky to leave without incident. 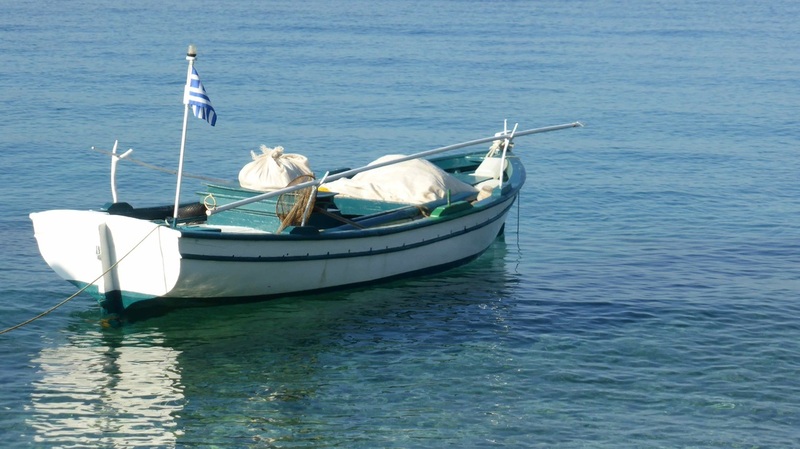 We had been talking about doing some sailing while we were in Greece, and Lyn found a half price deal not far away, so we booked for a week, really looking forward to it. We met up with Hakan and Thomas again on the ferry, so stayed at the same hotel as them in town. We seemed to click, so the four of us went out for tea that night, had a great time, and, as usual, drank too much wine. Seems to happen when we spend all night laughing and talking........ The next day we said goodbye to the guys, and promised to look them up when we got to Sweden. 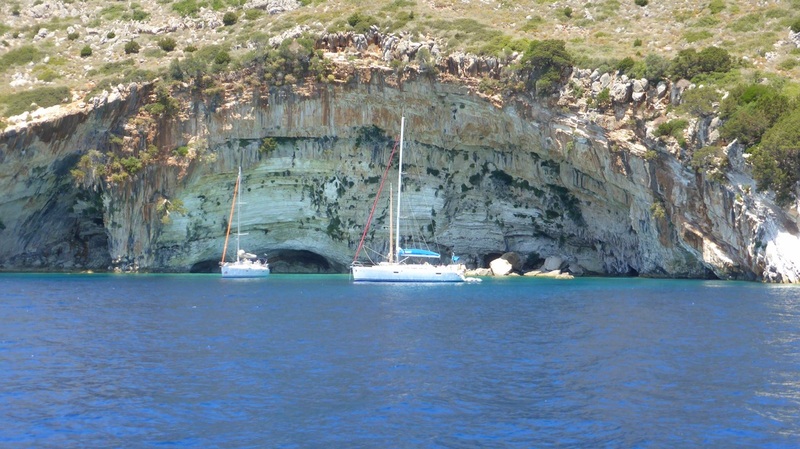 We headed to the southern tip of Corfu, to a room for half the price of the hotel in Kerkyra, and right on the water. There was another couple of riders there, an Austrian couple, who had ridden a similar route to us down the coast, nice people. The hostel had a great location, but the wifi kept dropping out, AC was extra, (and expensive), rooms were nice but very hot, lots of mozzies, and noisy, so we moved out the next day to a quieter place on the other side of the island, 2 minute walk to the beach, all good, so we stayed two nights. 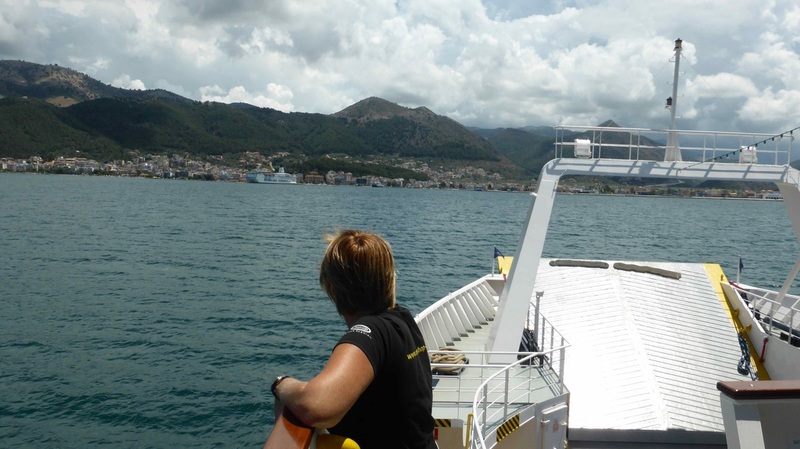 We said goodbye to our hosts, and rode down to Lefkimi, where we caught the ferry to Igounemitsa. Mr grumpy ran the shop at the ferry terminal, this guy took sour to whole new level. A one hour ferry ride to the mainland, and then a very scenic ride through a very narrow windy mountain road, where we passed two cars in just under an hour. Everyone now uses the new motorway, but we opted for the scenic route. There was a big storm building in the mountains, but we just caught the edge of it, a few drops of rain and some wind before we made Ioannina, where we had booked a room for the night. 25 euros, fairly new, big room with a kitchen, very nice. A stroll down to a restaurant for tea, and we met 4 Austrian bikers who we had a chat to for a while. We had heard about Meteora, a monastery build on top of rock cliffs about 100 kms east of where we were, so headed off for a look. We had to back track a bit to get to Nydri, our destination for the night, but it was well worth the ride. We climbed up through the mountains to about 1700 metres, and there were plenty of opportunities to fill our water bottles from the springs that flowed out through pipes beside the road. There is a motorway with tunnels we took on the way back, which cut the trip time by about two thirds, but the mountain top ride had terrific views, even though the road had been let go. There was gravel on some corners, it was getting overgrown in some places, and obviously was not a priority to spend money on now the motorway was open. We didn't realise Greece had country like this, beautiful. After a big day we arrived at Nydri on Lefkada island about 8.00 pm, but it was still daylight, and we quickly found an apartment for about 25 euros for the night. 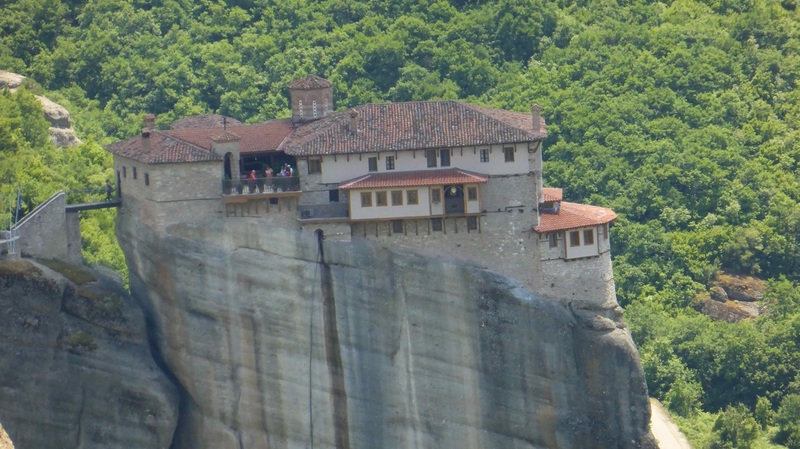 Meteora, the monastery built on the top of the rock outcrops near Kalabaka. 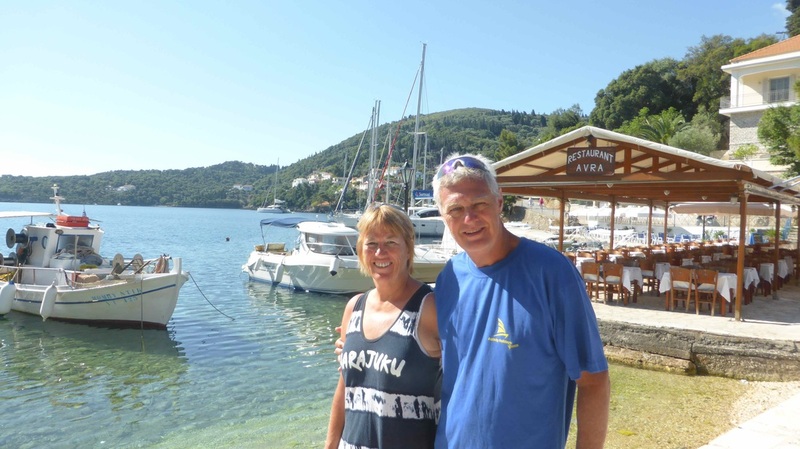 We met Ben, who owns Activity Holidays Greece, and got sorted for the upcoming week on the boat, a 30ft Bavaria. It was a fantastic time, we were lucky with the weather, and the others on the boat, James the skipper, and Malcolm, who was back for the second time in two years he enjoyed it so much. I managed to get my day skippers ticket, and Lyn her competent crew certification. I can highly recommend these guys, they know there stuff, and can't do enough to make sure everything goes well for your time with them. 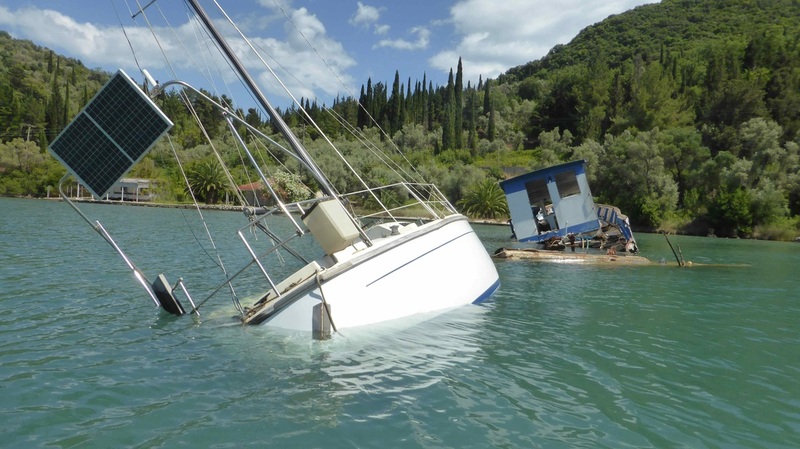 Oops, someone needs to redo mooring 101. A boat near the harbour that sunk a couple of days before. 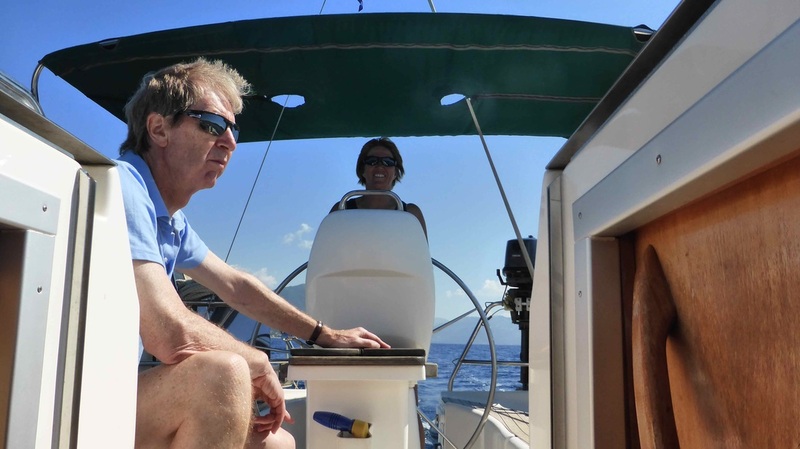 After a fantastic week sailing the Ionian islands, we headed back to Ionnina, the same route we came down, on our way to the Bulgarian HU meeting. We booked in at the same guest house we stayed in when we were there a week ago. There was a bit of rain around, but it was only light, until we stopped. After that, it bucketed down, for once we got the timing right. The next day we rode through Kozani and Katerini, a terrific road around the south of Mount Olympus. There was a little rain, but not bad, just enough to slow us down on the corners. We continued on to Paralia, a tourist town on the coast that smelled of seaweed, which was all along the beach, but we were tired, so got a good hotel room for 30 euros for the night. The next day we would cross into Bulgaria. Greece had been great, one of my favourite countries, mainly because of the people, who were really genuine, and meant it when they said "Can I help you?"